The day started on a high. I woke early, checked my email and discovered that I had had four sales overnight. Sweet!! That has never happened before! Then I pulled myself together and went out to put my name on a list for a nearby liquidation estate sale. I was at the house around 6:30 (just as it was starting to get light) for a 9:00 a.m. sale…and darn it, I was still #26 on the list! When the heck are people getting there to sign up?? I went home to have breakfast and came back at 8:00ish. Saw one of my fav picker friends Diane so we chatted until they lined us up. I was a tad grumpy being so far back in the line (even though there were tons of folks behind me) and it was easy to start thinking that all the “good stuff” would be gone before I got in. And then I thought, what if it is? There will always be other sales. (In fact there’s another one next week!) But before you know it, I was inside the house. The rooms were small, packed with belongings and people. I think I made a smart move heading up to the master bedroom on the second floor first as there were only a few of us up there. It is a weird pawing through someone’s belongings–opening up drawers, boxes, closets–but I did it and found some nice lady stuff…scarves, vintage hankies, nice leather gloves, a ’70s Avon Empress compact. And a few bits of vintage clothes…like a wacky yo-yo quilt vest (I’m convinced someone is going to want this!) and a nice tartan wool kilt with leather straps. 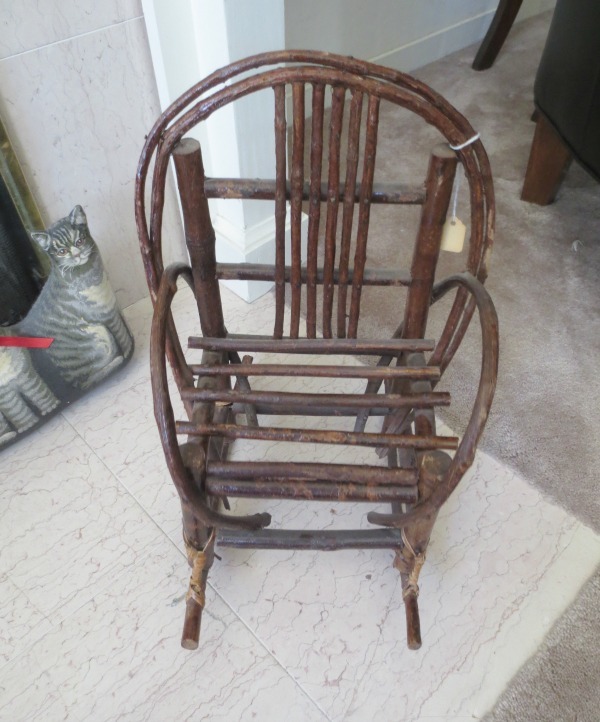 Downstairs was bedlam, but I did snag a vintage rustic twig doll chair. And what I thought was my best find…a 1951 Goebel king that belonged to a nativity set. I was soooo excited that no one had grabbed him yet. Alas, alas in the car I looked him over more carefully I saw something I can’t believe I missed…do you see it?? He had been decapitated and clumsily repaired. DARN! I think this kind of damage is going to make this worthless unless I undertake some restoration which I’m not sure I want to attempt. How about you? Any good finds to share?